If you’ve been heading out on camping trips regularly, then you’re probably aware of the importance of a survival lighter. In fact, a good lighter could make a vast difference in times of trouble, don’t you think? A survival lighter is one of those must-have products – both for your traveling backpack and for your survival kit. 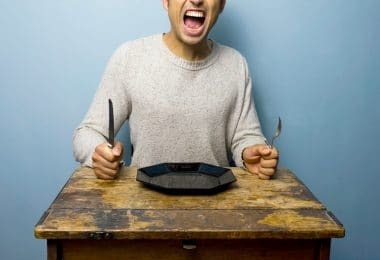 However, choosing a fine product out of so many may sometimes seem like mission impossible, and it gets even trickier when you have to purchase a reliable product that can make all the difference in dangerous situations. Although the final decision depends mostly on your own requirements, we’ve taken the time to go over some more popular choices out there and point out which features matter the most when buying a lighter. It’s our hope that your purchase will be going much smoother once you’ve read and understood the most basic features. Before offering you the reviews of lighters we thought you may like, we first went over the features some of you could think of as the most important. Don’t forget that those might change depending on your personal preference, as well as the budget you have. 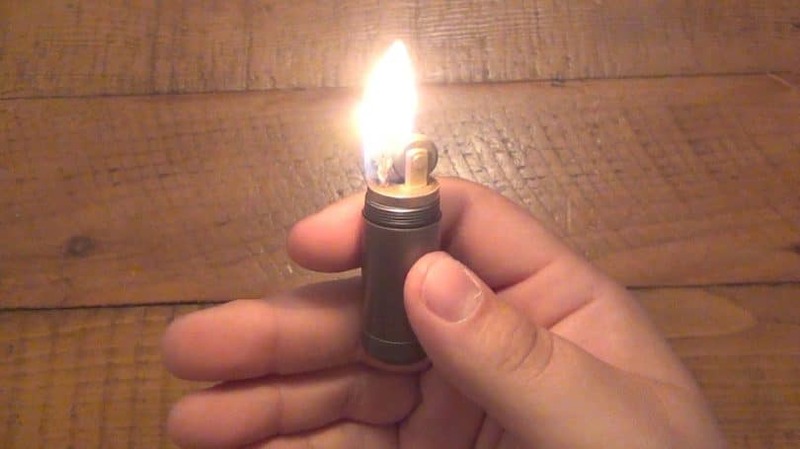 This is probably one of the most important features of a survival lighter – you’ll want your lighter to be small and light. A good survival lighter shouldn’t occupy too much space in your bag or kit – ideally, you’d want it to be compact enough to fit in whatever bag you’re going to carry it with you while still keeping most of its basic functions intact. Capsule lighters prove to be the most effective solution in this case – with them being extremely light and compact, they might as well be your new best friend. Another thing to pay attention to is the carrying pouches and cases some manufacturers include with their lighters, as those are important for safety purposes. Lighters usually come in two variations – disposable or refillable ones. This makes the next big thing you should pay attention to when buying a lighter. One big advantage of the refillable lighters is that you can refill them as many times as you want, thus saving money in the long run. Usually, refillable lighters help increase the longevity of the product as well though you will have to remember to regularly fill it up. On the other hand, if you opt for a disposable one, you won’t have to worry about regular fill ups, but you will have to get rid of it eventually. The refillable option is definitely not a must-have though some users find it extremely useful. Since it’s a survival lighter, you’ll want it to be sturdy and durable – you wouldn’t want it to break the minute it hits the ground, would you? When shopping for a survival lighter, it could be for the best to go on and do the investment – get a durable item that would last you longer. Ideally, you’d need a product that can be robust and strong and can sustain a lot of pressure without much hassle. A good option here would be to choose a product that is made from stainless steel to ensure that it does not get rusted with prolonged use. The direct flame is a pretty important option many users tend to ignore. It is of highest importance that your lighter will light up even in situations of wind and/or rain, so consider getting one with a direct flame. Most of the time, lighters like this are mainly torch-like flames. These high-performance lighters can be used in different conditions without having to worry about their safety or efficiency. Available in variety of shapes, you can definitely find the perfect one for you. 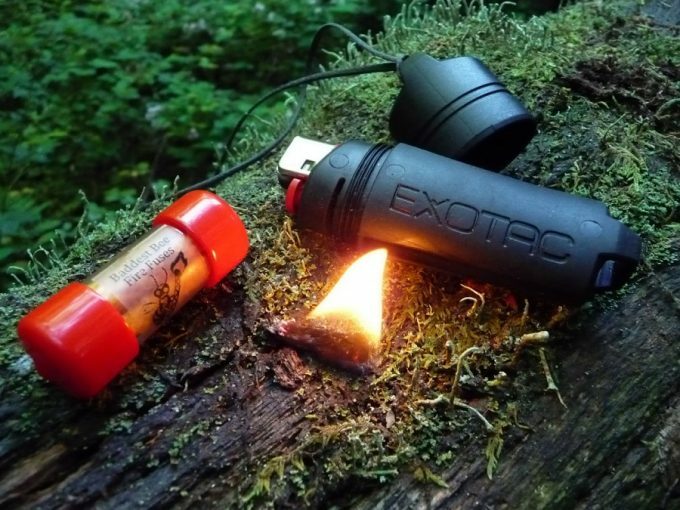 The waterproof feature is very important when it comes to survival lighters. This is mostly because you’ll want to be sure that the lighter would still work well even if fully submerged in water. Most of the time, waterproof lighters have a protective covering that keeps water and air out of the fluid. Sometimes, the floating type of lighters would also work well for circumstances like this. Once again, this is not a compulsory feature to have in your survival lighter, but it could definitely be helpful. Certain brands come out with hands-free versions that prove to be very useful. These are multi-purpose lighters that do more than just light a fire – this frees up your hands so you can engage in other activities. Sometimes, the hands-free lighting versions act as a source of heat which may be useful. These are only some of the features that you should look for in a survival lighter. We hope that by now you’ve realized more or less what’s important for you. To aid you further more, we have compiled a list of the best survival lighters available on the market. Here are the reviews of some of best survival lighters on the market. 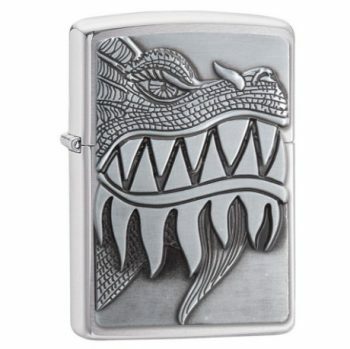 Description: We like what the Zippo Dragon Lighters has to offer you – it’s sturdy while at the same time being waterproof, which should be good enough to cover you no matter the conditions where you’ll be using it. The waterproof and windproof design should help you get the maximum out of your product. Made entirely out of metal, the product is light and compatible at the same time. The distinctive ‘zippo’ click will let you know whether you’re using it properly or not. The manufacturer offers a lifetime guarantee in case of the lighter not working properly, which is one of the best parts about the product. As far as the durability is concerned, this product can surely give you years of usage without affecting its performance. 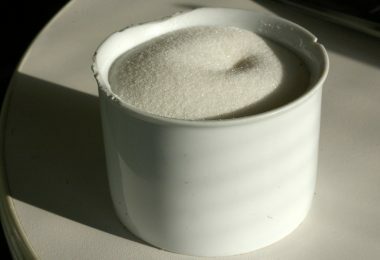 For maximum results, it may be for the best to use it with the fluid from the same brand – however, do note that the fluid is sold separately and isn’t included with the lighter. Another reason why many find this lighter a worthy purchase is the 360-degree multi-cut carving that is wrapped around it. The gold plated insides add a whole new charm to it, while at the same time not compromising on the weight of the lighter. 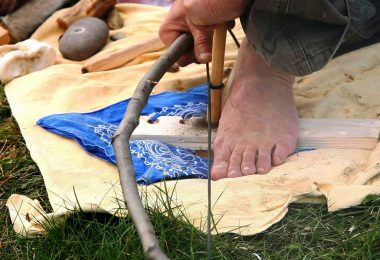 By the looks of it, this may be a great option both for camping trips and for survival use. Related: If you want to get the maximum out of your Zippo lighter, then the Zippo Lighter Fluid may be the way to go. Coming with more than an affordable price, the fluid offers clearer and better burn than most fuels. On top of that, it’s almost odorless and less irritating to the skin compared to other fuels. 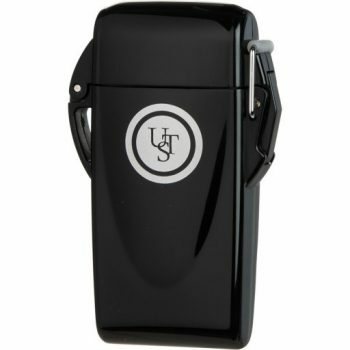 Description: The UST Stormproof Floating Lighter is another exciting option when it comes to outdoor travels. The butane lighter comes with a lot of capacity while at the same time, being extremely small and light. The lighter proves to be very effective due to its windproof feature – if you’re heading out to a windy destination with heavy rains, then this should be your number one option. Considering it’s labeled as stormproof, the product should work to your advantage from every angle and in every situation. The item may be seen as the perfect thing for your backpack for those hiking or camping trips. 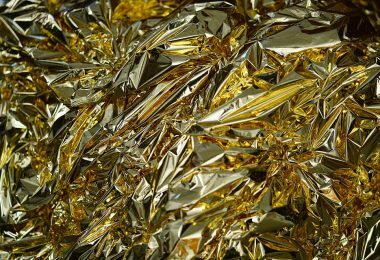 It can also be used as an essential component in an emergency kit or a survival bag. The lighter should light well most of the time without much hassle, meaning that you can use it anywhere and at any time. The flame should come off good and strong enough to suit most user’s needs. Add to that, the device locks tight such that it becomes convenient to use it. Some of the users have reported situations of using this light in wind speeds of 35 mph, temperatures as low as 13°C, and conditions of the wind driven snow and have still managed to get an optimum performance out of it. With all of that being said, this could be seen as a decent purchase. 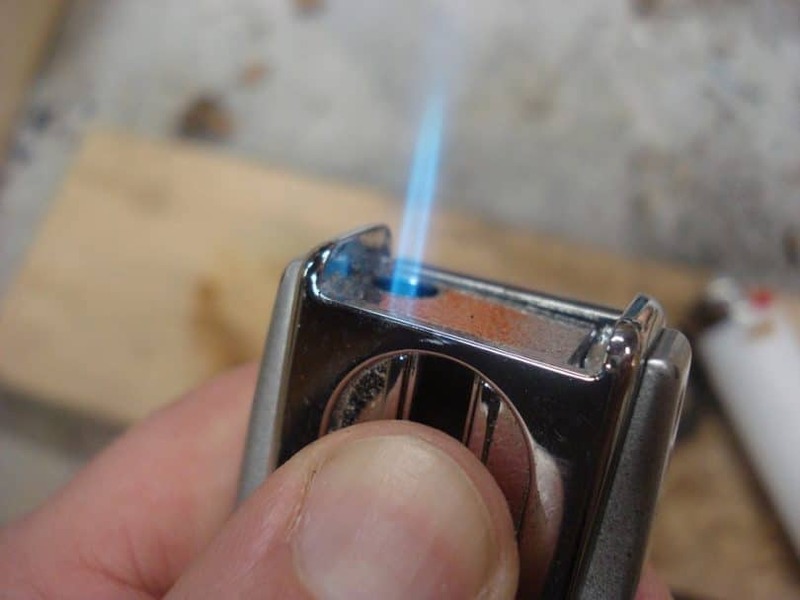 Related: The Zippo Butane Fuel should work well for most lighters. It has a universal tip that can be used to fuel most leading butane lighter brands and most importantly, won’t clog the burner valves. The product comes with more than a decent price and can also be used to fuel butane candles. Description: The Scorch Torch Dominator Triple Jet Flame could prove to be an exceptionally efficient lighter – butane torches can become your new best friends during long hiking trips. It’s a combination of a cigar or cigarette lighter with a punch cutter tool. For starters, even though it may not look like it, the triple jet flame should be extremely safe to use. This means there would be no harm of injury if you carried it outdoors for different purposes. The butane inside can be refilled as and when required. The flame is adjustable in nature, meaning that you can easily adjust the flame strength to match your preferences. The lighter may be a bit heavy though it gives off a strong feel and it has a sturdy construction. The whole product comes with a safety cap that keeps other items in your bag protected. As far as the durability is concerned, this lighter should be able to work for days and weeks at a time. However, if the durability is a concern to you, then the manufacturer offers a warranty that extends for up to 1 year for all manufacturing related defects. The fuel has to be added separately to avoid the chances of accidents though do note that the fuel is not included here. Related: The Colibri Premium Butane Fuel is a decent choice when it comes to fuels for your refillable lighters. This set comes in a package of three cans, which makes it a pretty good deal regarding the price. The fuel should give you a clean flame and stay off from clogging any valves. 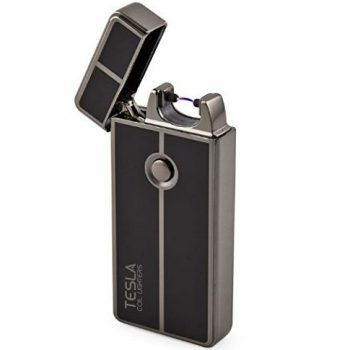 Description: If modern-day products are your thing, then the Tesla Coil Lighter could be your thing – the lighter is completely electric! Actually, one of the best things regarding this lighter is its charging mechanism – it can be charged only with the help of a USB port and cable! 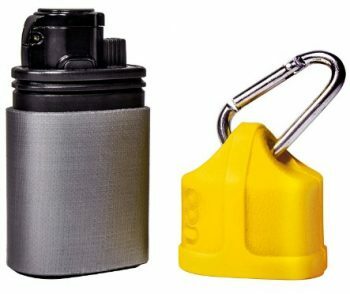 This makes it very convenient to be carried around everywhere with you since you wouldn’t have to worry about running out of fuel. On top of that, another perk is the long battery life of the lighter – one single full charge on the device can take it as far as 100 to 300 uses, which may be months for some users. Not only is the lighter extremely easy to be used but it’s also safe – the chance of burns should be limited to a minimum. The flame lights with a click of the button located in the middle and that’s it – you’re done! The rechargeable lighter doesn’t use any additional fuel or fluid. Owing to this feature, this product is extremely windproof because it does not make use of any flame. For anyone wondering, the lighter also contributes towards the well-being of the environment because of its eco-friendly nature. The special safety feature ensures that the product does not get lit up when in storage, which makes for one of the biggest safety advantages of the electric lighter. With its sleek and elegant design and its efficient performance, it is surely something to look forward to. USB charging – no need for fuel! Related: If you’re looking for a great survival kit to add your lighter to, then the Risen Tactical Military Camouflage Pouch may be just the thing for you. The kit comes fully equipped while at the same time featuring enough storage space to add your own items, such as lighters, fire starters and so on. 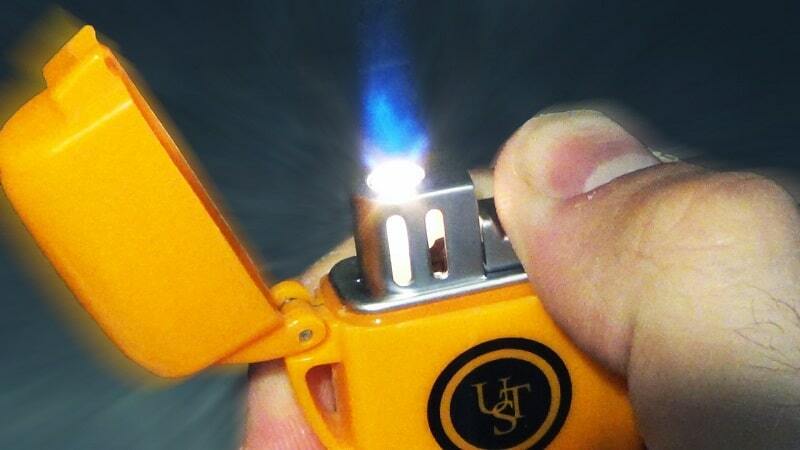 Description: If durability is your priority, then the UST Floating Lighter should be your top pick, as it can give you that much-needed long lasting performance. The product has been quality tested and should maintain a decent standard of working. 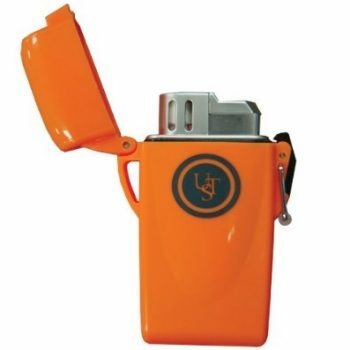 The lighter has been designed to feature sturdy materials that should uphold even the toughest of tasks and its distinctive orange color makes it stand out among other items in your survival kit, something that should help you when you may need to grab it quickly. Its waterproof feature is just one of the many reasons why it might be a suitable choice for you, as the device should float in water without any damages being caused to it. Another top perk is its special windproof characteristic that allows the lighter to be used even in wind speeds of 80 mph. As far as the safety mechanism is concerned, the lighter has an O-ring seal that comes secured with a locking clasp. This ensures that the product does not remain exposed when not being used. Because of its compact style and slim design, the lighter should fit comfortably in any pocket or pouch. The device comes with a 2-year limited warranty that should be enough for most users. Even though it ships empty, you can easily refuel it – the lighter holds up to 4 grams of fuel at a time. Overall, this is a decent option for a durable and efficient lighter. Related: If you’re looking to buy a reliable fuel for your lighter, then the Vector 14x Gold Butane Gas might work well for you. Suitable for most lighters, you could easily choose the number of bottles you’d like to purchase, depending on preference. Considering the price and the fact that it doesn’t clog whatever device it’s used for, it should make for a great deal. Description: The UCO Stormproof Torch Windproof Lighter is ideal for long hiking and camping trips, as well as for any survival kit. The lighter is refillable and works on butane fuel – it might as well become your perfect travel companion! However, do note that the butane isn’t included when you purchase the product out of safety concerns. Once filled, the lighter has enough filling capacity to light the device at least 700 times. 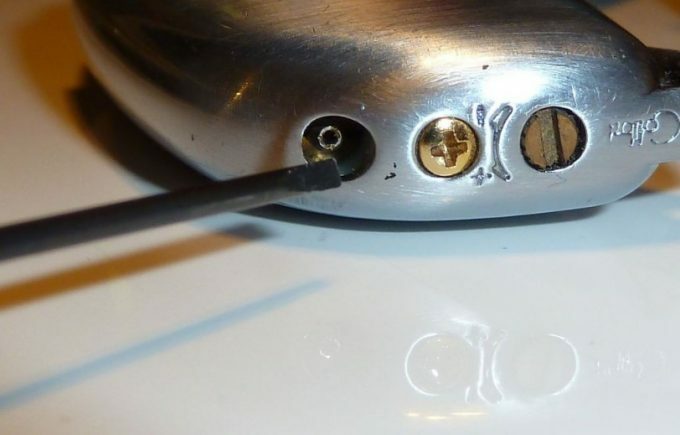 On top of that, it features a special ignition system that should help cater to your needs pretty well – the device also has a triple jet flame that gets to be adjusted. The lighter is made out of a sturdy material that should be sturdy enough and allow you to use it for quite some time. The windproof and waterproof features should work pretty well for most of the users. Apart from that, a great option of the lighter are the two styles you can get it in. One features a utility tape on the top in the length of 3 feet and the second one has a bottle opener on the top – you could choose which one might be more useful for you. 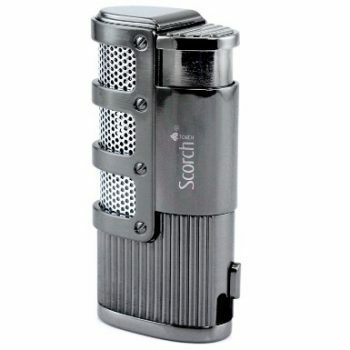 Regarding the low price and the durability of the product, it might as well become your new favorite lighter. 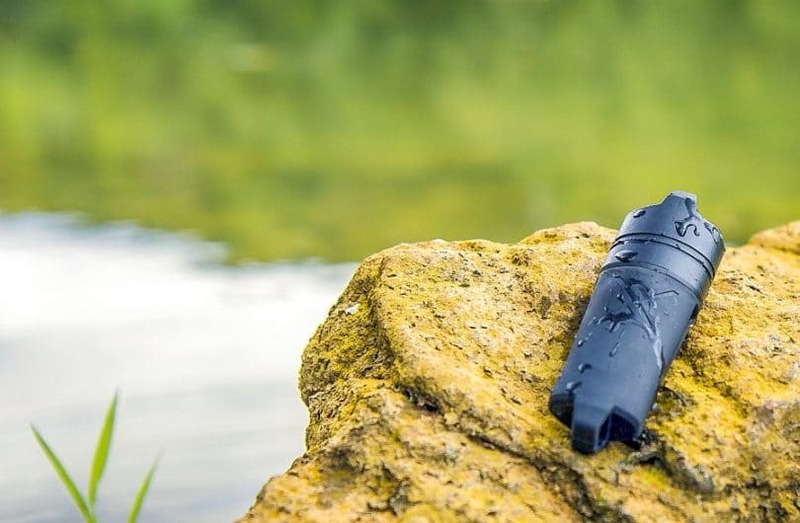 Related: If you’re just completing your survival kit, then the LifeStraw Personal Water Filter might be what you’re missing! Filtrating more than 99.9999% of waterborne bacteria and 99.9% protozoa, the straw should supply you with clean drinking water even in most desperate times. The straw can be used to filter up to 1,000 water while at the same time is extremely easy to be carried around. We’ve come to the end of the article and by now you’ve learned a few more things about lighters and the features you should consider before purchasing the perfect product for you. Remember that a decent survival lighter can be of great assistance during camping and hiking trips! Do you think we might’ve accidentally missed out on some great products out there? Check out our comment section and leave us a comment – we’ll make sure to include it next time!